Posted by admin in activity reports, Africa, Dubbi, Eritrea, eruptions, Nabro. Ever since news of the eruption in Eritrea began to seep out early today the identity of the volcano responsible has remained unclear. Dubbi was a prime candidate (and that’s the one Toulouse VAAC went for [UPDATE – Toulouse VAAC has now confirmed that the volcano is Nabro) but with the release of high definition MODIS satellite imagery from the Aqua satellite it is now pretty clear that the eruption originates at Nabro (as Mark Dunphy at Irish Weather Online and several commenters at Eruptions and Earthquake-Reports had suggested, so due acknowledgements to them for their insight). The image below comes from Aqua/MODIS, 10:45UTC 13 June 2011. Nabro is a stratovolcano reaching to 2,218 metres a.s.l., truncated by nested calderas of 5 km and 8 km diameter, the latter caldera having a wide breach to the SW. Although Nabro has no recorded Holocene eruptive activity, the GVP (from which this description comes) notes that ‘ Some very recent lava flows were erupted from NNW-trending fissures transverse to the trend of the Nabro volcanic range’, so if the current activity is from the Nabro complex it does not necessarily represent the surprise re-awakening of the volcano after millennia of dormancy. Wiart and Oppenheimer (2005) identify these ‘recent basaltic flows’ as originating from ‘Vents … located between Nabro and Mallahle calderas, and fed in part from fissures aligned perpendicularly to the NVR [Nabro Volcanic Complex] axis’ (p. 104), although, working with strictly limited data, they do not venture a date for these flows. Satellite imagery shows these flows as weathered, but fresher and distinctly darker than surrounding material. Above. Map of the Nabro Volcanic Complex from Google Earth, incorporating information from map in Wiart & Oppenheimer (2005), p. 106. Yellow line is the Eritrea/Ethiopia border. 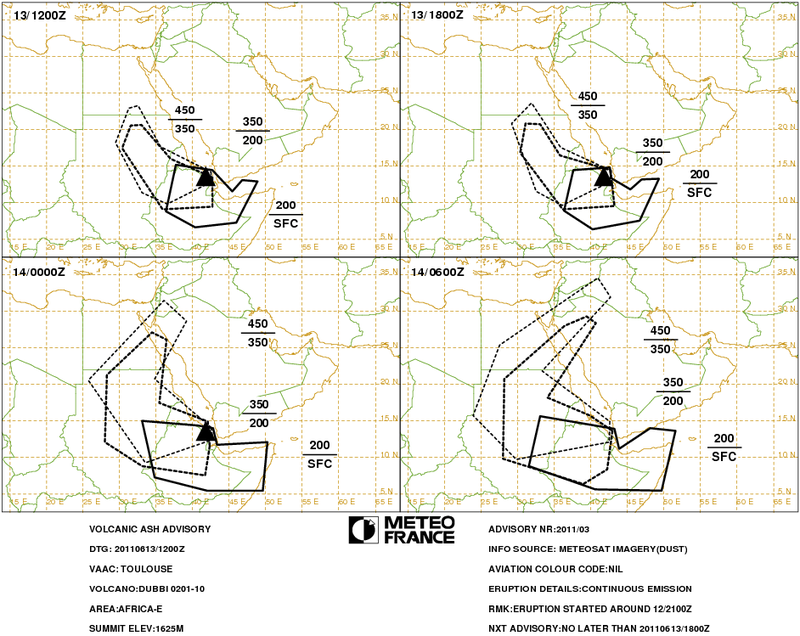 Toulouse VAAC has issued a new ash advisory at 1200UTC for the volcano it is still calling Dubbi, reporting ash at altitudes varying from FL200 (20,000 feet/6000 metres altitude) in the vicinity of the eruption to FL450 (45,000 feet/13,700 metres altitude) to the north, where the plume curves back around to the east (map in .png format) after spreading across Ethiopia to reach Israel, Jordan, northern Saudi Arabia and western Iraq. In Israel the Jerusalem Post is reporting that the ash may disrupt flights from Eilat in the south of the country. Erik Klemetti has an update on the Eritrea event at Eruptions (just before he goes away on honeymoon too, so congratulations and all good wishes to the happy couple). And have a look at this video from Earthquake-Report.com at YouTube. The International Big News Machine is now catching up with this eruption. BBC News and Associated Press have both published reports in which they confidently identify the volcano concerned as Dubbi, based on the information from Toulouse VAAC. Reuters says it’s Dubbi, mentions that some people think it might be Nabro, then goes right back to talking about Dubbi again. And U.S. Secretary of State Hilary Clinton, attending some international get-together or other in Addis Ababa, is flying out early because of the ash cloud blowing in from Eritrea. UPDATE: Toulouse VAAC has confirmed that the volcano erupting is Nabro in its latest volcanic ash advisory (issued 18:00 UTC); and via Twitter comes this photograph of Nabro’s plume, taken from ~200 km away by Mark Haldane. The volcano in question has never erupted in recorded history and no history of eruption is documented on GVP web site. So at this time I would say that is going to be hard to predict what this volcano is going do as this is the first historical eruption in this volcano. This is an almost completely unknown volcano: no historical records, and little field research has been done. Maybe what we are seeing at the moment is a fissure eruption along the lines of the eruption that produced Wiart & Oppenheimer’s ‘recent basaltic flows’, maybe it is something quite different. At the moment we just don’t know. is the last time this volcano erupted,formed the red sea and the mountains surrounding it?? ?is it possible to recreate such energy? let me rephrase it;are we heading to a massive disaster?? No, there’s no reason to think that this eruption is a sign of a forthcoming ‘massive disaster’. Volcanic activity is an entirely normal thing in this part of Africa. The tectonic processes driving the volcanism are the same forces that formed the Red Sea, though – and eventually those same forces will pull this side of Africa apart completely. But that is millions of years in the future.